The 'Almighty's bows-and-arrows' have reappeared in the sunshine of West Cork mornings. The martins and swallows are back to old homes and old eaves - perhaps not as 'perfect' as in The Wind in the Willows - and are bringing smiles with their swoops about farm buildings, sloping fields and plodding cows after milking. The birds are a reassurance of seasonal change, uplifting the hearts of those beings below them going about their daily tasks. 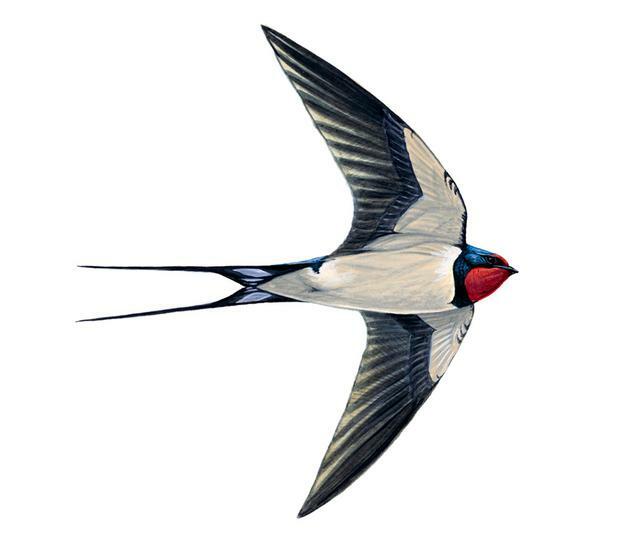 On April 1, the first swallow (hirundo rustica - fainleog in Irish) seen by one reader/farmer brought a text: "Single swallow whizzing around the farmyard this morning. Great to see them back just as we've moved back to summertime." Their bow-and-arrow image - the martin (delichon urbica) is gabhlan binne in Irish - is perhaps because they, among spring's earliest arrivals, have been shooting up from Africa, and along the Atlantic coast after a four-week migration, not without its hazards of dust, tempest and predation via the Straits of Gibraltar. Cervantes wrote "una golondrina no pace verano" (one swallow doesn't make a summer) and the first West Cork bird has been joined by others, all seeking nooks of memory in outhouses, barns and porches to put a stamp of summer days to come of insect chasing high in the air and grass-top skimming among grazing cattle. Returning swallows, especially younger birds, may start to build anew with mud and grass, but others will return to older homes which will be refurbished. They are practical birds; I have seen mummified remains dumped out in a spate of nest renewal, an abandoned chick of a very late brood when the urge for going became overwhelming. Old nests become more durable as time passes; one was recorded in Britain as being in continuous use for more than 40 years. There were, and perhaps still are, some home-owners who do not welcome swallows and martins to their properties, and knock down nest materials, hoping the birds will move on and not soil the decor of their porches. But thankfully there are also people who consider it a blessing to have a wild bird's nest at their home. As the swallows and martins were returning, there were groups of much larger birds also in the skies, and bird-watching tourists to Andalusia in Spain have been looking out for kites, storks, buzzards, eagles and vultures making their way into mainland Europe. The big fellows travel in daylight much lower in the sky than smaller birds. Once most people believed swallows spent winters beneath lakes in a torpid state! Dr Samuel Johnson wrote in the 17th Century: "Swallows certainly sleep all winter; flying round and round and then thrusting themselves to lie in the bed of a river." A century later, the naturalist Linnaeus (who gave most wild creatures their Latin names), still wavered about migration. But one 19th Century Corkman, the Rev F O Morris, was emphatic. "Our swallows are not 'visitants'," he said. "Although absent for much of the year, it is with us that they inhabit their dwellings and rear their young." Now they are back, their long tails giving them great manoeuvrability, and reminding us that summer is just down the road.